Every now and then, my girlfriends and I have an extreme hankering for Thai food. And we always ALWAYS head to Bangkok Restaurant in VI. Food: The food is GREAT! PLEASE NOTE – the portions at Bangkok are HUGE! It’s best to go with friends that you can share a plate with. Whenever we go, we always order pad thai. Theirs rivals any I’ve ever had in the US, so it keeps me coming back for more. My friends like to order the shrimp/mayo spring rolls, which I’m not a fan of – only because I don’t like mayonnaise that much. 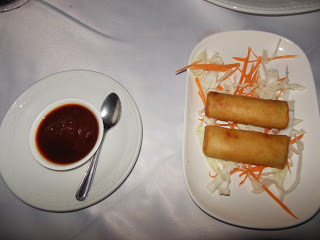 But going by their ‘mmms and aahs,’ I daresay the spring rolls are yummy. They also love the Thai iced tea and usually get up to 2 refills. The meat entrees are also delectable and spices not overpowering. My only concern is that the meat entrees don’t automatically come with rice – you have to order a side to go with it. My girls and I usually end up taking food home with us. Ambiance/Décor: Well, this leaves quite a bit to be desired, especially for a “fine dining” restaurant. They need to update the look and the furniture. It almost seems like one of those old restaurants my parents took me to when I was a child. Bangkok restaurant has two sections, one smoking and the other non-smoking. In addition, there’s a side room with a little bit of privacy if you come with a group of friends. Service: The waiters and waitresses are friendly, especially the presumably Thai ladies. The ladies might actually be friendly to a fault… I took a friend there for his birthday, and he was a little freaked out because the Thai lady kept hovering near the table to make sure we were fine, to clear our used plates and ask if we wanted refills. Overall Value: Dishes are generally over N2000, but take into consideration that the portion sizes are huge. They also have regular and large sizes. The regular sizes are enough to feed 2 people. View Bangkok’s take away menu here and regular menu here. I used to be a serious Bangkok regular! It's pretty close to my office and I totally share your view on the food, value etc. Unfortunately there was this one time I ordered while recovering from the flu and found hair (that obviously wasn't mine) in my pad thai 🙁 🙁 I was already feeling ill and that made it so much worse..needless to say I haven't been back since. The upside is its saving me money cos that was an expensive lil habit I was indulging in. The downside is I dont know any other places with good thai curry and pad thai- I'll keep checking for your reviews.